LEGO artisan Sean Kenney‘s latest masterpieces are currently on display at the Philadelphia Zoo, in the mesmerizing exhibit ‘Creatures of Habitat: Gazillion Piece Animal Adventure.’ Throughout the exhibit of meticulously constructed endangered animals, children are educated about the importance of preserving the earth’s biodiversity through a zoo-going medium very familiar to them. Aside from the well publicized outdoor sculptures, the artist also created a series of smaller dioramas depicting the actions that can be taken in an effort to re-grow our rain forests. The completed exhibit required a total of 259,450 LEGO bricks! Saving endangered species, even virtually for the zoo’s exhibit, is no small task. 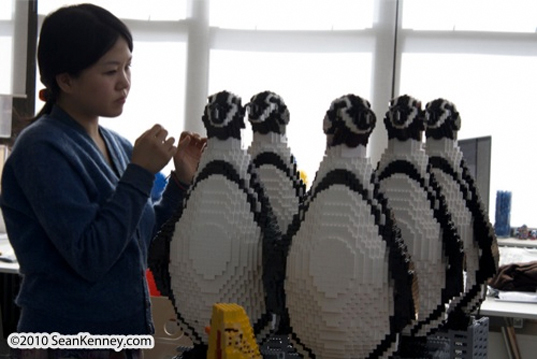 Though Kenney might might have employed a few tricks in getting the sculptures from their basic brick form to the finished anatomically correct models, there isn’t much difference between his building process and the one used by the many nimble fingered fans of the LEGO toys. 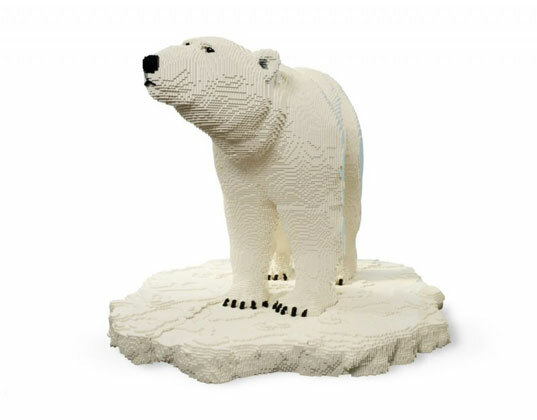 The polar bear LEGO sculpture alone took Kenney and his team of assistants 1,100 hours to build and required over 95,000 LEGO pieces. On his website Kenney calls the bear “the largest and most visually complex sculpture I have made to date.” Add to that the menagerie of other animals (including monkeys, elephants, penguins, turtles and swaths of rainforest) the artist created, and you will get a full appreciation of the his work. 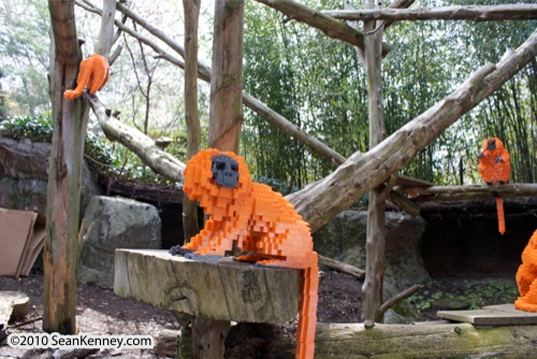 As the pictorial shows, Kenney’s sculptures are made from the tiniest LEGO building blocks. This fact should not be lost on visitors (or virtual visitors here on the site). Just as the artist constructed his amazing sculptures one tiny brick at a time, so too can our environmentally educated kids rebuild the ecosystem with small but impacting gestures. Kenney is the most recent artist to join the ranks of those who have been working alongside scientists to document the planet’s endangered species. While zoologists race to find a means to preserve the earth’s endangered animals, the animals and their cause have been saved for posterity in photographs, paintings, sculptures and less conventional mediums such as rug weavings, plush toys and figurines. Sean Kenney’s ‘Gazillion Piece Animal Adventure‘ is on display at the Philadelphia Zoo now through October 31, 2010. There are more photos at the artist’s website. 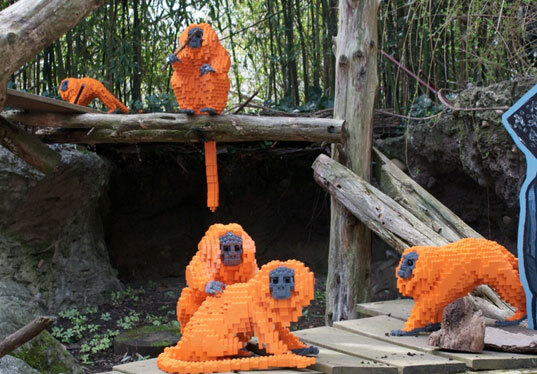 LEGO artisan Sean Kenney's latest masterpieces are currently on display at the Philadelphia Zoo, in the mesmerizing exhibit 'Creatures of Habitat: Gazillion Piece Animal Adventure.' Throughout the exhibit of meticulously constructed endangered animals, children are educated about the importance of preserving the earth�s biodiversity through a zoo-going medium very familiar to them. Aside from the well publicized outdoor sculptures, the artist also created a series of smaller dioramas depicting the actions that can be taken in an effort to re-grow our rain forests. 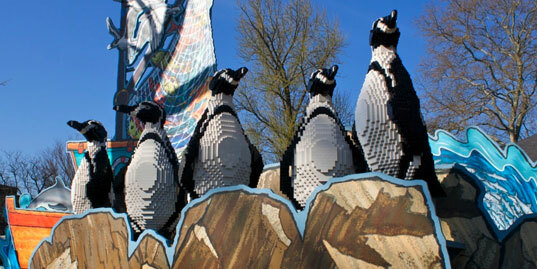 The completed exhibit required a total of 259,450 LEGO bricks!